I love having people over for lunch, dinner, coffee, whatever, but the reality is that it’s getting increasingly challenging to invite people and have any idea what to offer them. It seems like everyone has some sort of dietary restrictions and/or preferences these days, and finding something that everyone can eat is often fairly difficult. It’s a serious matter too: an allergy (such as peanut or shellfish allergy) can be life threatening. A food intolerance is usually a less serious condition - in that it doesn’t involve the immune system - but still, it should never be taken lightly. A food preference is different though. Some people don’t like fish. Others eat no meat, egg or dairy. I, for one, am not a big fan of gluten or refined sugars — but I don’t get sick if I eat a slice of pizza or a bagel. These are personal choices, but they should be respected nonetheless. I consider myself a tolerant person and what a person does in their own living-quarters has always been entirely their own business. When I entertain (wait, did I just used that term? O.M.G.) I always make sure to have at least one or two things each person can have. For instance, I have a vegan friend who gets uncomfortable by the sight of people eating meat. He’s polite enough not to say anything, but I know how he feels. So when I invite him over, there’s never meat in sight. That said, I don't always cook 100% to everyone's issues, but I rather make sure that I have a few options everyone can eat. If I know someone is allergic to nuts, then I won't put them in the salad, but I may pass them around for people to add — that type of thing. I also do my best to avoid cross contaminating by using the same spoon to stir different foods. Also, nutrition is one of those fields where there are a lot of strong - most of time conflicting - opinions. I don’t want to spend a dinner discussing each person’s dietary choices. When someone brings up the topic, I try to divert the discussion. People can get very defensive and the conversation may easily get heated; best thing to do is to take the conversation away from that uncomfortable area. 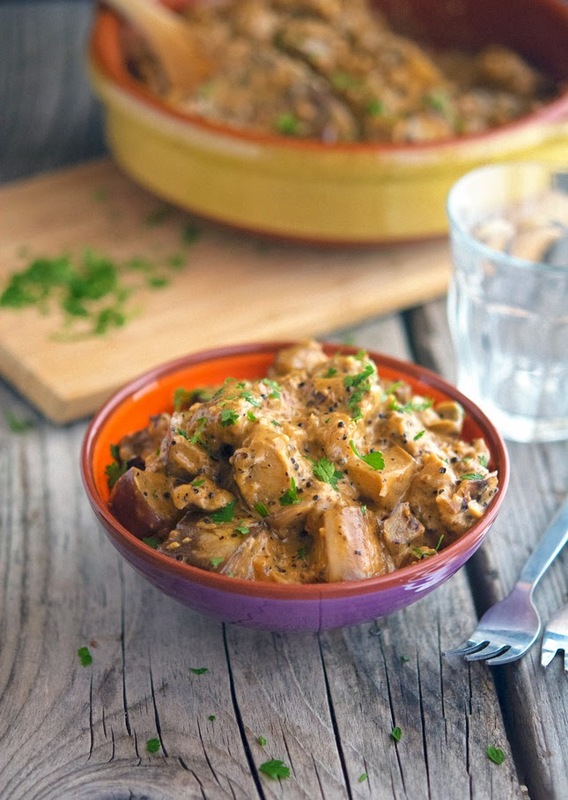 Moving on to today’s recipe: Creamy Coconut Eggplant Curry. This is one of the dishes I make when I have friends with diverse dietary needs. It accommodates vegans, lactose-intolerants, cavemen, food combination dieters, and - more importantly - people who like delicious things. I always feel a little mischievous when I make it, because I know I have a trick up my sleeve. It looks and tastes it takes a lot of time to make, so it’s fun to see the shock on everyone’s face I reveal that it’s made with few ingredients and it’s super simple. It is actually so rich and creamy, no one can believe there's no cream or even dairy in it and that it’s completely healthy. It’s sort of a perfect and delicious recipe, no one has ever complained about it! 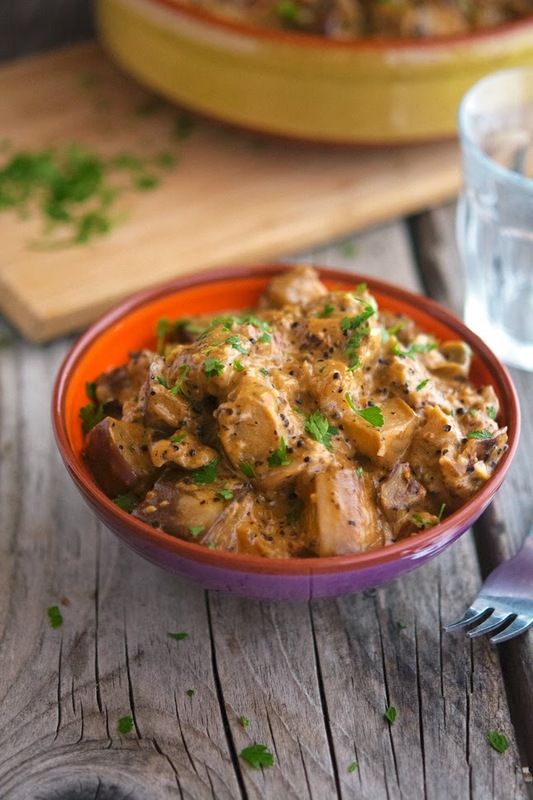 Creamy Coconut Eggplant Curry Print this recipe! Heat 2 tablespoons of coconut oil in a large skillet over medium-high heat. When it’s sizzling hot, add eggplant cubes and saute’ for about 6 to 8 minutes, stirring every now and then. Once eggplant cubes have browned, transfer them to a plate. Set aside. Return the skillet to the stove, add remaining tablespoon of coconut oil and heat over medium-high heat. Add cumin seeds and mustard seeds, cover with a lid and let them pop for about 30 seconds to 1 minute. Lower the heat, and add garlic, ginger and red pepper flakes. Saute’ for 2 minutes, until fragrant. Add onion and salt and saute’ for about 8 to 10 minutes, until translucent. Add tomato paste, coconut milk and garam masala and bring to a boil. Add eggplant cubes and cook for 10 minutes, until sauce starts to thicken. Serve sprinkled with chopped cilantro. One serving yields 305 calories, 27 grams of fat, 14 grams of carbs and 5.5 grams of protein. I agree with you but I enjoy his company a lot (he's very smart and funny) that's way I try to do my best so he can have an enjoyable eating experience whenever he comes over! Coconut Milk is truly wonderful in curries with all 'em spices! Mike I think your eggplant curry rivals my mom's - my mom fries (instead of sautes) her eggplant so it's almost caramelized before adding spices and coconut milk! Oooh - wish I had this for lunch today, instead of my boiled eggs and beets! Looks amazing Mike, can't wait to try this! Wow, this looks awesome -- I love eggplant! Thanks for sharing. Can't wait to try this. I'm not usually the biggest fan of curry but I can be swayed to eat anything with coconut milk! Especially served with rice. Yum! I love coconut milk, especially in curries. It adds so much creaminess! Looks rather delicious! Funny thing, I actually made a recipe with eggplant the other night thats going up on the site soon, although it's with pork. This looks like one I'd make as I too have friends who don't eat meat. Thanks Mike. Can't wait to hear all about that recipe Kev, sounds awesome! definitely what i need for my meatless monday!!! It gets a little tricky these days accommodating everyones food preferences, but you've put it into perspective and given some simple solutions when entertaining. The eggplant curry looks fabulous! I can imagine how wonderful it smells when it's cooking! Pinned! Curry is one of my favorite foods, love that you used garam masala here. Looks delicious Mike! Mine too and I love Garam Masala, it packs so much flavor! Great strategies for accommodating food preferences. I find it gets even trickier when kids are involved. Besides for all the adults' allergies, preferences, etc. I also have to contend with picky kids - one won't eat anything white (seriously), another won't eat onions, another won't eat tomatoes.. It gets tricky. Feeding kids is a tough job indeed. How funny though that your kid doesn't eat anything white...does that include mozzarella on pizza and whipped cream? I love finding new ways to cook veggies. 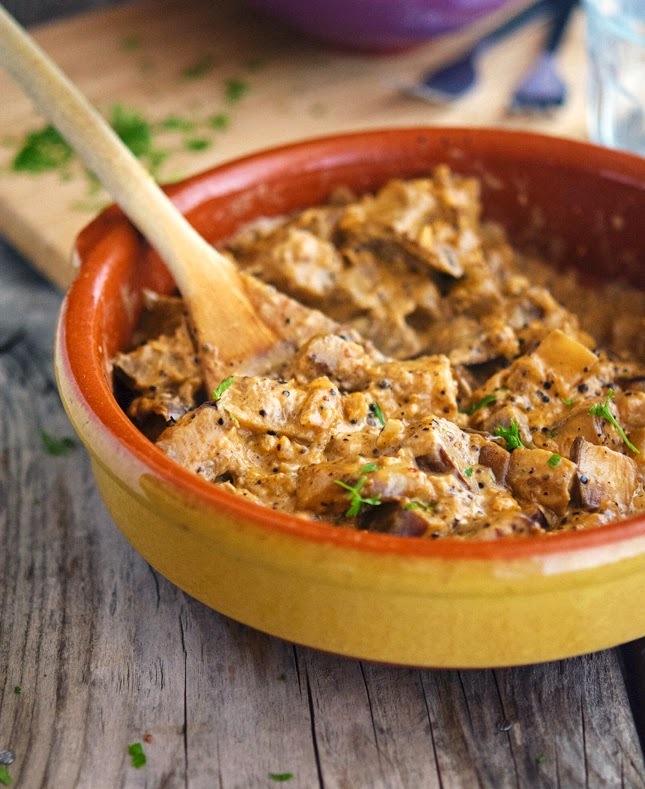 I can definitely see myself making this eggplant curry for dinner during the week.. it looks so delicious and full of flavour. Great recipe & Pinned! Thanks T, this recipe is definitely a keeper! Mike you keep whipping out epic recipe after epic recipe. I love 'entertaining' too and fortunately, not many of my friends are tooo picky. Your friends are cool, but then again everybody is cool in Australia! This recipe sound awesome loving the sweet, salty, and herby flavors of the this dish! So awesome! AND LOVING THE NEW DESIGN!! I knew it had been a while since I'd been over here, but didn't realize it was that long.. Dang! I'm so happy you like the new design Krista, thanks for stopping by! I agree that hosting lunch/dinner has become super difficult nowadays. Everyone has some kind of food restriction or is on a special diet. But, this recipe looks great and I'd love to try it out soon. Curry is so yummy! Curry is awesome, I can't get enough of it! So don't talk about religion, politics, money... and food diets. Except sometimes I like the heated debate... it's kinda fun sometimes if I'm in the mood hahahaha. And dude, this is definitely #wolfpack worthy. This looks insanely good Mike. I've been obsessed with it ever since I saw the pictures. Now I have this vision that's stuck in my mind... It's giving me neeeeeeeeds! I can practically smell it and it's yummy! So what would you consider a large eggplant? I ask because I picked one up today for this recipe and I'm not sure if I should cut the recipe in half or not. It is about the size of the one on the left in this picture. It also has a few bad spots (got it on discount) that need to be removed. http://www.luurtsema.com/images/EggplantBlackBeauty.jpg Considering halving this recipe just to be sure. Eggplants vary in size so much! That is actually a fair point, but I say use the whole eggplant (cleaned of the dark spots though). Even if it's a big eggplant, there's a lot of sauce in this recipe and it should be plenty! I recently made this and it's absolutely amazing! 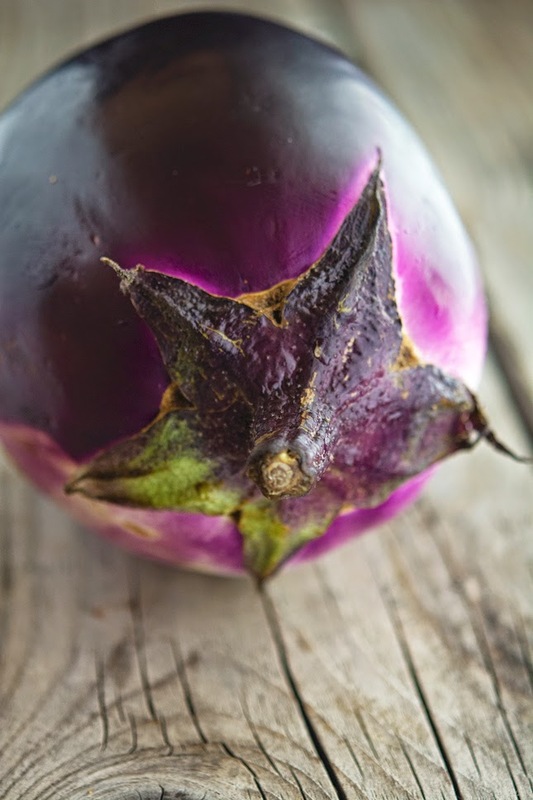 Thank you so much for posting what I now consider a "go-to" eggplant recipe! Dee-lish! I randomly googled 'eggplant curry recipe' and decided to go with your recipe based on my ingredient availability and the simplicity of making this! turned out exactly as the photo and is delicious. I like spicy food and am a meat eater but a lot of my friends are vegetarian/vegan and can't tolerate spicy foods - this curry will be excellent for potlucks, entertaining, etc. Thanks! This was very good, but very spicy and i am generally ok with spice! LOL. I added diced sweet potatoes and crushed cashews. We're new to a plant-based diet, vegan I guess you'd say.I saw a similar dish in the hot trays at our local Whole Foods market. I noted the name & ingedients (but no recipe), so did an Internet search, found several similar, but this seemed closest. I followed the reciipe, here, as closely as possible and the result was mind-blowingly good. When popping the cumin and mustard seeds for the suggested time, the mustard seeds burned a bit. My seeds may be old, though. For dishes like this, I prefer my steel wok to a skillet and the eggplant, cooked for the suggested time got a little overdone. Delicous, though. The outcome was still awesome. I Wish now that I'd had a larger eggplant. I withheld the salt until near the end. Turns out that it wasn't needed. I added a couple things: One small red chili pepper for color, and a handful of chopped peanuts and cashews. We found the "heat" to be perfect. This is a KEEPER! Thank you so much! I made this today and LOVED it. Thank you Mike! Looks great, but is there actual curry in this? Thank you for sharing this recipe, I am having it as I type this haha. It's amazing! A touch of turmeric is the key to bring out the flavors more. Great, easy, full of flavour and healthy. Thanks so much for making this recipe available. So easy, and soooo tasty. Just made this and it was great! Thank you. Can I substitute mustard powder and cumin powder instead of the seeds and if so about how much? This recipe looks amazing!